I love anything mint flavored. And combine it with chocolate? 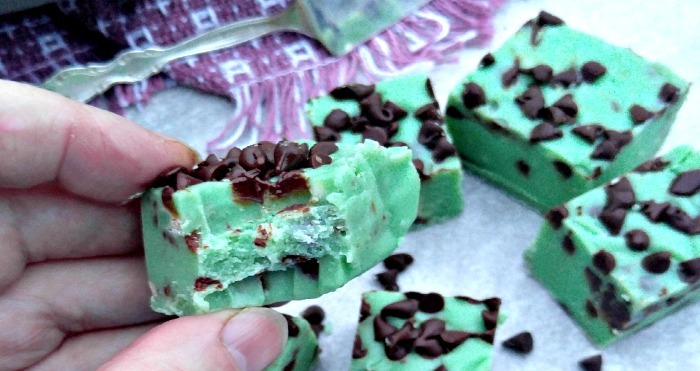 This Mint Chocolate Chip Fudge is rich with an out of this world taste. It’s the stuff that Christmas dreams are made of! Fudge is one of those things that is either super easy to make or a “pull out your hair” experiment from a failed attempt at cooking it long enough. I’ve made fudge both was, and believe me, easy is my favorite. If you are looking for a pretty fool proof fudge, choose one that has either marshmallow fluff or sweetened condensed milk in the list of ingredients. What could be easier? There is no candy thermometer to mess with, no standing over the stove stirring to make sure it doesn’t stick. Melt some chocolate, decide on a flavor, (mint for me please) press the mixture into a pan. And voila! A few hours later you are in your jammies eating your fudge! 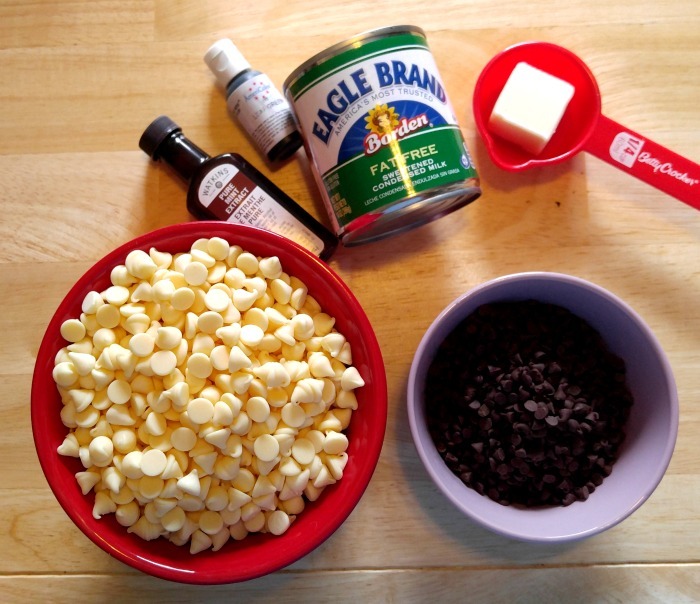 It’s time to make the Mint Chocolate Chip Fudge! 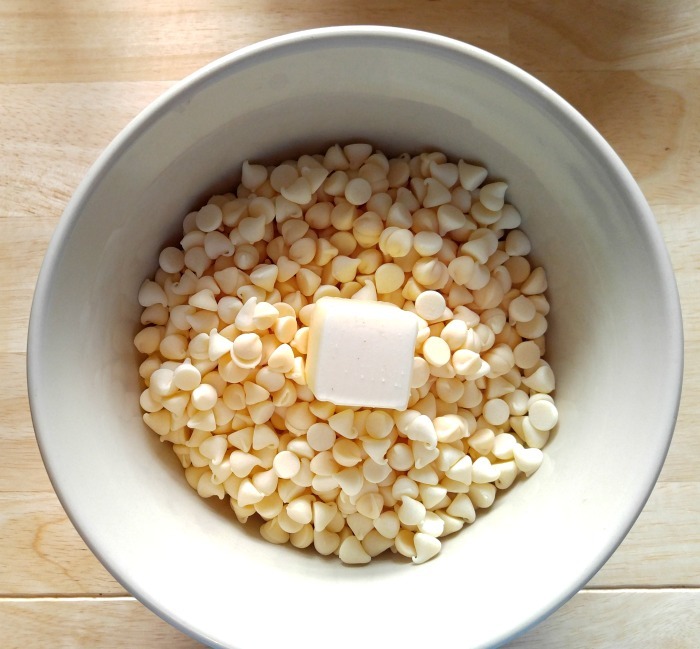 This fudge is so easy and it only has a few ingredients: white chocolate morsels, miniature semi sweet chocolate chips, sweetened condensed milk, butter, and mint extract. I used green gel food coloring to get the color I wanted. Start by preparing your pan. I use either parchment paper or aluminum foil, larger than the base of my pan, and line the pan with it, leaving enough paper left to form some handles. This makes the fudge very easy to remove after it has set. 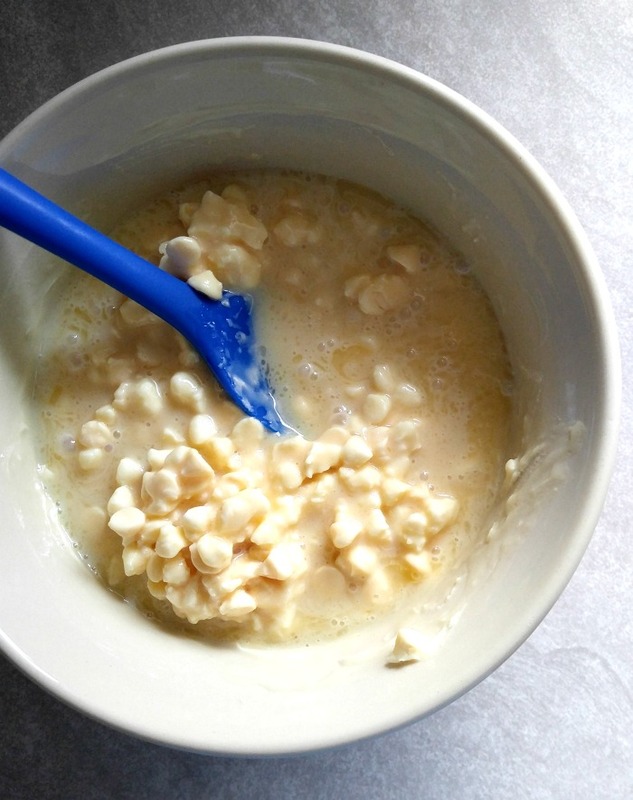 Place your white chocolate morsels in a microwave safe bowl with the unsalted butter and heat for about 2 minutes. The mixture will be lumpy at this stage. Stir in the nonfat sweetened condensed milk and the mint extract. Be sure to get a MINT extract, not peppermint. It has more of a creme de menthe flavor than peppermint extract. Heat for another 2 minutes in the microwave. 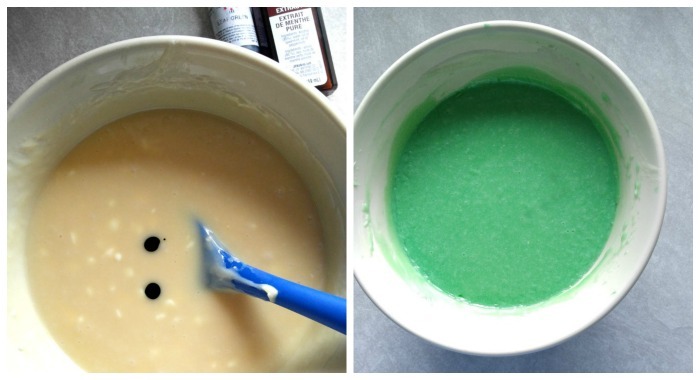 Add some green gel food coloring and stir the mixture well to get the desired green color. I used two drops and it gave me the color I wanted. Heat for another minute in the microwave until the mixture is very smooth and silky. 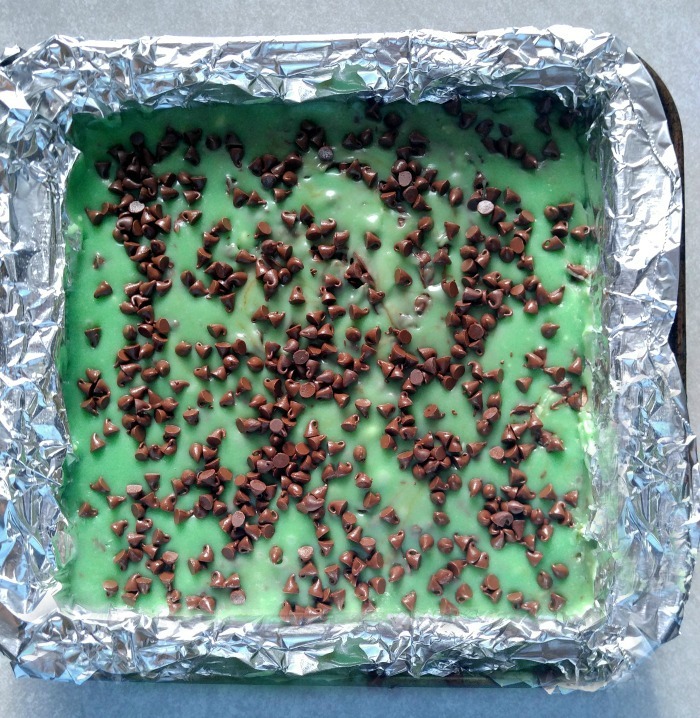 Allow the Mint Chocolate Chip Fudge to cool for a few minutes then fold in 1/2 cup of the miniature chocolate chips. Stir well and pour into the prepared pan. 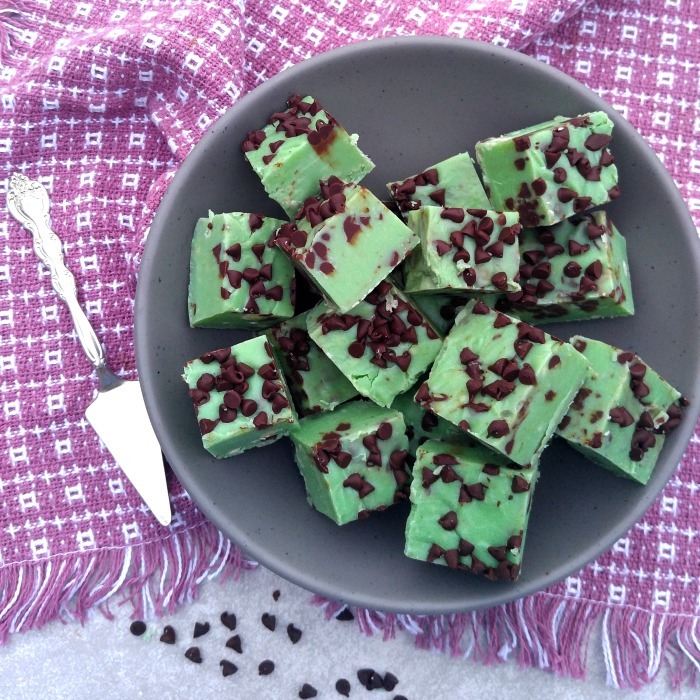 Press the Mint Chocolate Chip Fudge into your prepared pan. Sprinkle over the remaining mini chocolate chips on top of the fudge and gently press them into the mixture. Place in the fridge for at least 2 hours to set. Remove and cut the fudge into squares. 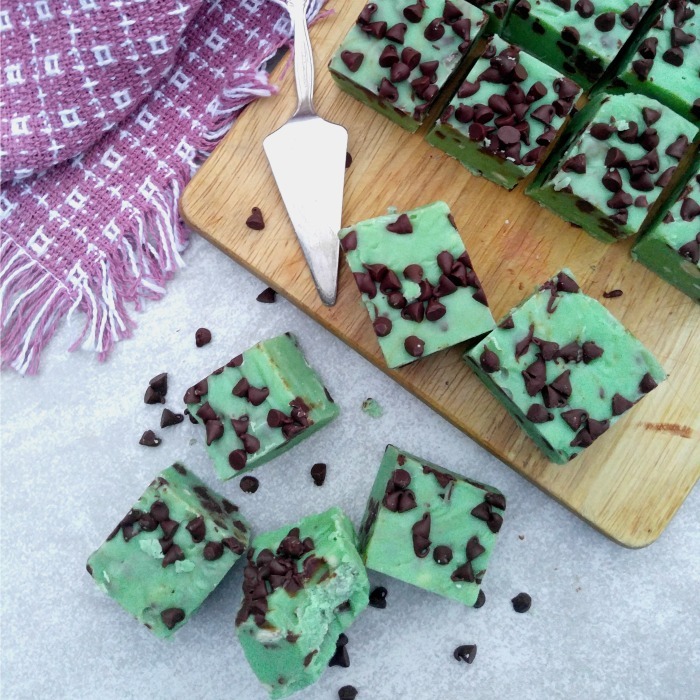 Every bite of this delicious Mint Chocolate Chip Fudge will remind your guests that the holidays are almost here. The only question will be “should I have one piece or more?” It is a fudge recipe for those who like really intense and very sweet fudge. 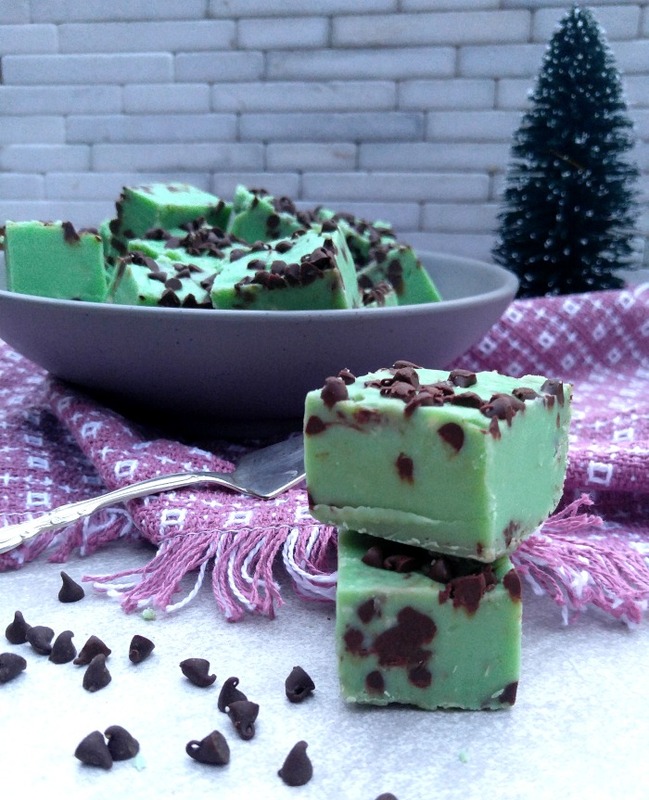 This Mint Chocolate Chip Fudge will be the hit of your holiday dessert table. Your guests will be asking for the recipe, I promise. It’s up to you whether to share or not!! 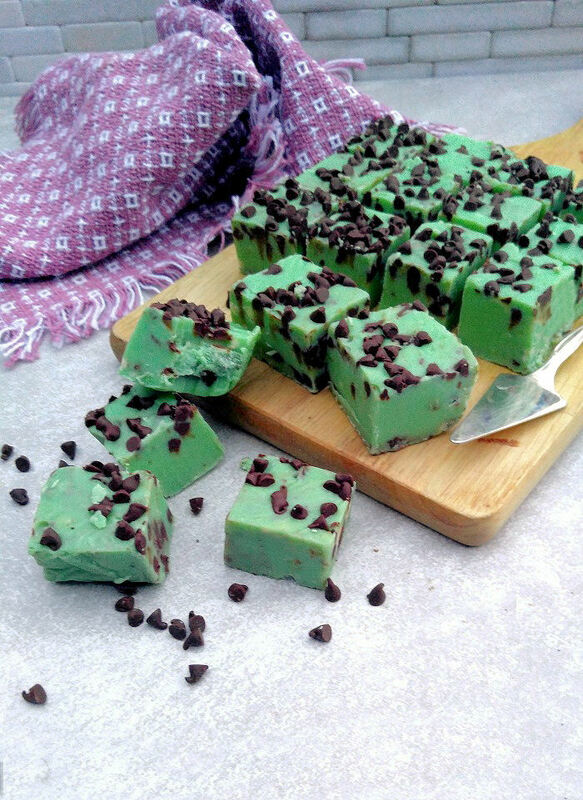 Thus Mint Chocolate Chip Fudge has a creamy texture and the decadent taste of dark chocolate. It is so easy to prepare. What are you waiting for? Go make some today! For more great fudge recipes, visit my Candy Creations board on Pinterest. Line an 8 x 8 square pan with foil or parchment paper to make the fudge easy to get out later. Leave some extra paper to use as handles when the fudge is done. Lightly spray with cooking spray. Set aside. Allow to cool for a few minutes then fold in 1/2 cup of the miniature chocolate chips. Just made your Crusty Herbed Italian Bread. The flavour is good, but it was very dry & dense. It is almost identical to my standby bread recipe, so I compared the ingredients an found an error/typo. Your recipe calls for 1 Cup of warm water. It should be 1 1/2 Cups of warm water. Hope this fix helps other bakers!